Reception and Artists' Talk: April 6, 2-5 p.m. Artists' Talk will start at 2:30 and go till 3:00 or 3:15 p.m. 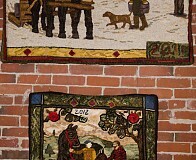 The central image in this rug is based on our wood pile. We stack six cords of wood underneath the shed roof of the barn each year to burn during the winter. The borders developed as I worked on the rug: first the flames consuming the wood, then the stripes and gentle curve I like to do, all breaking into each other. Trees, from which the wood comes, are in the corners. And the final border on three sides is the sun, from which the energy stored in the wood comes. 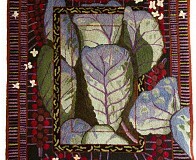 The central image of this rug is the leaves of some of the Fallstaff Red Brussels Sprouts I like to grow. The sprouts are indeed a deep red, and while generally smaller than their green cousins, they are nutty and tasty. But I think I grow this variety mainly for the beautiful leaves. The leaves were a challenge because their texture is smooth, so I didn’t want to blend colors the way I usually like to, as I wanted to convey something of the texture. Surrounding the leaves are the little green caterpillars that the white cabbage looper moths on the outer borders love to deposit on all members of the brassica family. 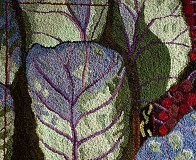 I abstracted the red sprouts with their cut leaves for the border around the caterpillars. 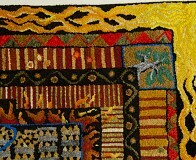 Many of the rugs are scenes from the artist's travels in France and include cafés, rooftops and window reflections. 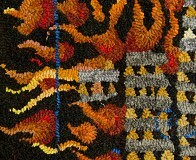 Logsdon favors using fine #3 cut wool strips to create the depth and detail she is after. The artist maintains a teaching studio at the Montpelier Arts Center in Laurel, MD and has been summering in Maine over many years. 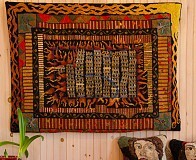 She has exhibited her work extensively in many states and countries since 1980; has had work included in major books and periodicals including Fiberarts Design Book, American Art Collector, Hooked Rugs and Rug Hooking Magazine. She has taught workshops throughout the country. It is human nature to create. We have witnessed this over time, and throughout the world—the desire to design, to decorate, to leave objects behind that give us a clue about what it was like for that person at that particular place and time in history. Ivory shaman’s charms of the Tlingit, quilts of the Amish, ceremonial masks of the Dogon, are all examples of man’s creations. Fourteen years ago our family moved to Maine from the Midwest. We had lived in many places across the USA and Canada, but never before in Maine, nor in a rural area. We embraced this lifestyle change. Four years ago, I took an introductory class in wool rug making from Ken Carpenter at his shop, Maine Hooked Rugs, in Brooklin. 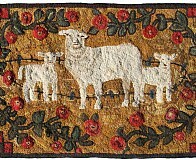 It was about this time that Mildred Cole Peladeau’s book, History of Hooked Rugs in Maine 1838-1940, was published. 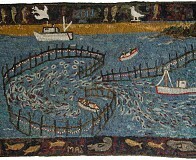 Peladeau’s research exposed the vast reach of the practice of rug making throughout all the villages, the islands, and the cities of Maine. Her book documented a wealth of extraordinary rugs. 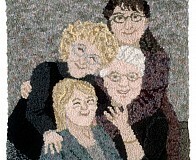 My approach to rug hooking is a slow one, even though I have an image in mind. With no overall pattern transferred to the linen before beginning, this manner of working keeps me engaged. 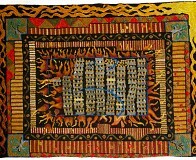 My rugs are unique, but traditional elements, such as lamb’s tongues and diamonds are incorporated. Events occurring in my life are the inspiration for the creation of my rugs. These rugs are the keepers of those memories. I was a Conservatory-trained opera singer (i.e. the Peabody Conservatory of Music at Johns Hopkins University) and a professional macrame' artist during the 70's. 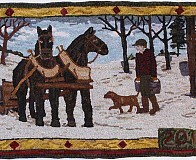 After a lifetime of pursuing various art and craft media, I started rug hooking in 2004 and found my passion. I began by doing portraits of family pets, and developed a style which has been dubbed "painting with wool,” and which I call "whimsical reality.” I am drawn to the aliveness of faces, whether animals or people, but also occasionally do seascapes and florals to reflect the beauty of the natural world which Maine living offers. I hand dye and hand cut my wool, utilizing various widths and textures to give my pieces a unique tactile quality. I live on a secluded salt cove near Popham Beach, where I love to walk and reflect. I occasionally teach in my studio and at Halcyon Yarn, and am very happy being part of the Maine fiber art community. I have been an exhibitor for "Arts in the Park” in Belfast and in Camden, for Coastal Maine Botanical Gardens in Boothbay Harbor, and have sold work through several art galleries along the midcoast. I am currently in special shows at Markings Gallery in Bath, at Maine Fiberarts in Topsham, and at The Pear Tree in Kansas City, MO. 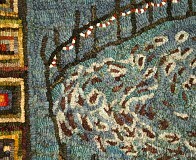 Our hooked rug exhibition has been made possible, in part, by Marion Brown Rug Hooking Studio of Belfast.